And colours of all people. 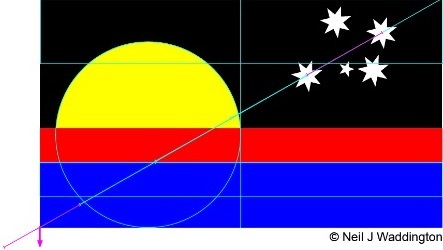 A new Australian flag design which embodies visual, social and scientific properties relating to the Australian country, it's people, it's history and its part of the universe. Many people ask us about our logo, particularly the flag. Waddington Educational Resources Pty Ltd was established as an Australian company in 1986. Our logo has remained virtually unchanged apart from the flag. We began with the Australian flag. 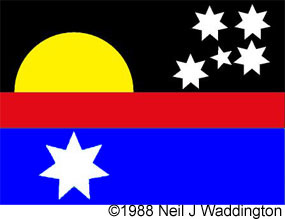 In 1988, when the Australian government of the day marked Australia's bicentennial - 200 years since the arrival of the First Fleet of British convict ships at Sydney in 1788), I developed an inclusive flag because I did not feel the Australian flag was truly representative of modern Australia, especially the first Australians. At the beginning of 2016, after more than 20 years of careful thinking and assessing adjustments, I reworked the design to further enhance its elements, establish critical new design points and remove the seven pointed star. The design is a simple Australian sky/land/sea scape. It shows the setting sun and the emerging Southern Cross. The red band represents the warm red earth between the night sky and cool blue sea. Besides it's pleasant Australian landscape look and strategic inclusive properties, it also has an intrinsic scientific layout to reinforce fairness and direction. The flag has 7 evenly split layers (reminiscent of the old 7 pointed star). The sun and stars take pride of place in two evenly split left and right portions. The sea band is twice that of the land and the sky is twice that of the sea. It's layout of the sun and stars is carefully based on finding Australian directions by day or by night. Hold the flag up matching the setting sun to your left and north will be about 90° forward (roughly in the direction that the bottom flag edge to the right-hand bottom corner points). Hold the flag up matching the Southern Cross and due south will be roughly below the left-hand flag bottom corner to the horizon (like following a vertical flag pole from the flag corner to the horizon if it was attached). The flag corner is the South Celestial Pole position, which is 4.5 times the length between the top and bottom star. When using the flag in this way, it reminds us of looking forward and looking back, not only looking forward to north and looking back to south, but everything else that might embody looking forward to a better, fair and equitable future that never forgets our past or whoever, or whatever, is below us. 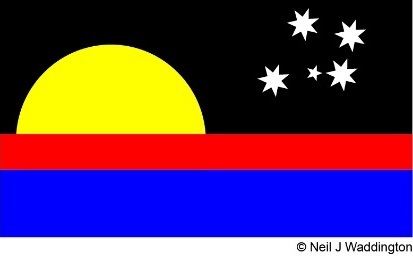 The colours are a true reflection of the varied human make up of Australia as well as indicating its historical past. One day Australia will have a new Australian flag. It may not be this one, but it's important to take a transitionary stand. My grandfather/great-grandfather and his grandfather worked and managed sections of the textile industries in Warrnambool (Victoria) and Yorkshire (England). In 2014, I visited Piece Hall in England where my early ancestors traded cloth, most likely cloth used to bandage and treat wounds hundreds of years ago. Today, we continue to attend to similar needs via our dedicated first aid service to schools and the wider Australian community. I want to thank you, our valued customers, for continuing to support the work we do and remind you that we are only a phone call or email away from attending to your individual needs.